This oven is programmed with a self diagnostics failure code system which will help for troubleshooting, H97, H98 and H99 are the provided failure magnetron and inverter circuit problem areas. This section explains failure codes of H97, H98 and H99. H97, H98 and H99 appears in display window a short time after start key is pressed and there is no microwave oscillation. DO NOT try to REPAIR this Inverter Power Supply (U) and also DO NOT RE-ADJUST PRESET VOLUME on the board. It is very dangerous to repair or adjust without sufficient test equipment because this circuit handles very high voltage and very large current. Off alignment or inverter board operation is dangerous. Operating a misaligned inverter circuit is dangerous due to the very high voltage and current that is produced by this board. Defective boards must be replaced with a new one. 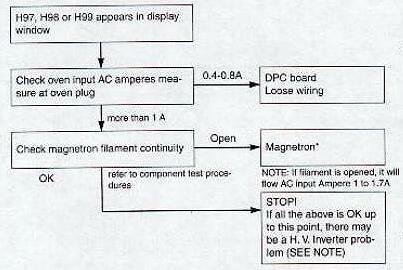 - Check magnetron filament for open or short to casing before proceeding to determine a good magnetron. Alternative way to troubleshoot oven with AC Ampere meter used. H97, H98 and H99 appears in display window a short time alter start key is pressed and no microwave oscillation with AC Ampere meter used for troubleshooting. SOLUTION: The following information is a guide for Sensor Quick Test Sensor Cooking Diagnosis, Fault "F" Codes and Gas/Humidity sensor detection test. If the number showing is between 15 and 185 then the reading is more than likely normal; however you need to go one step further and verify by performing a "SENSOR DETECTOR TEST"
If the number showing in the display is higher than 213 you more than likely have on of the following problems; sensor failed open, sensor unplugged, wiring, or smart board. If the number showing in the display is less than 6 you more than likely have s shorted sensor, or a defective board. F0 Humidity sensor program (open or shorted) at the start of cooking program. Press keypads 7 & 8 simultaneously and read sensor value showing in the display. Compare the sensor "Quick Test" values to determine is there a problem. F3 Shorted key panel (keypad/panel shorted for a period of over 60 seconds). You can test this feature by holding in one of the keypads for over 60 seconds - F3 will display. F4 Open humidity sensor during cooking process. Sensor was open for a period of over 60 seconds during the cooking process. F5 Shorted humidity sensor during cooking process. Sensor was shorted for a period of over 5 seconds during the cooking process. The Gas/Humidity sensor detects both humidity (steam) and hydrocarbons (food odors) during sensor cooking modes. 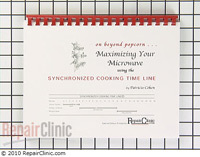 Place a 1/3 cup of hot water in the center of the microwave oven. Push the "VEGETABLE" pad of the key panel ("FRESH VEGGIES: will scroll across the display). The unit will begin heating the water and will display "FRESH-VG", until it reaches humidity "detection". 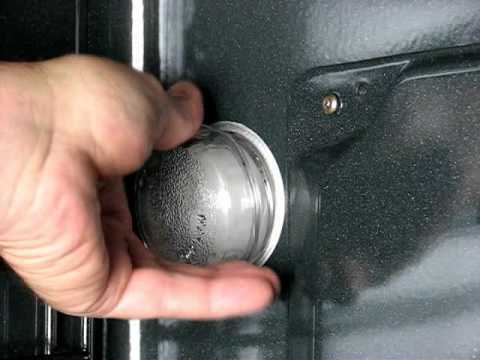 When humidity "detection" occurs, the control will beep and begin counting down. At the end of the cycle the control will beep and oven will shut off. If you successfully complete steps 1 through 6 with no problems, then the humidity sensor is operating normally; however, if you encountered a problem during this test (TEST FAILED), then suspect a problem in the sensor circuit (sensor , sensor wiring/connection, control smart board). F1 - ( open thermal sensor ), will occur below 190ºF of cavity temperature within 15 minutes of starting convection, combination or roast cook. F2 - ( shorted thermal sensor ), will occur if a shorted thermal sensor is detected continuously over 5 seconds on convection, combination or roast cooking. NOTE: it will take a minimum of 5 minutes of convection run time before F1 or F2 code will be displayed if the thermal sensor is shorted/open. F3 - ( shorted key panel ), will occur if a shorted key panel is detected continuously over 60 seconds. NOTE: It will take a minimum of 1 minute of run time before the F code will be displayed. F4 ( open humidity sensor ), will occur if humidity sensor is detected as being open continuously over 5 seconds. F5 - ( shorted humidity sensor ), will occur if humidity sensor is detected as being shorted continuously over 5 seconds. NOTE: It will will take a minimum of 15 seconds after the magnetron is energized before the F4 or F5 code will be displayed if the humidity sensor is shorted/open. Also the unit must be plugged into a 120 volt outlet for at least 5 minutes before sensor is checked, this also applies after the humidity sensor has been changed. Before checking operation of new sensor allow init to be plugged in for at least 5 minutes. F6 - ( shorted temperature probe ), will occur if temperature probe is detected as being open or not plugged into the receptacle. If probe is plugged in and "ProbE" is on display, check probe for continuity with ohm meter. NOTE: This "F" code and "ProbE" will happen immediately if probe is shorted/open. a) Open the oven door. b) Unplug the microwave oven for 2-seconds and plug it back in. c) Release the CANCEL keypad and close the oven door. You will see the following display. Power Failure: After a power failure, the WELCOME screen will be displayed. F2 —Keyboard Failure: Refer to the Tech Sheet and conduct a touch panel continuity test. F3H —Humidity Sensor Failure: Refer to the Tech Sheet and test the sensor. F6 —Microwave Relay Failure: Check the microwave relay. F7 —Microcomputer Board Failure: Change the microcomputer board. EE 3 Both magnetrons failed Call for service. 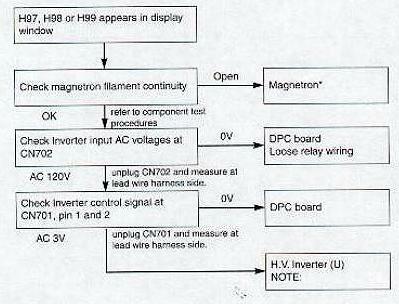 Voltage too high Follow instructions on page 5 of Operation Manual under VOLTAGE SELECT to change from 208V to 230V. If problem is not corrected, call an electrician. Voltage too low Follow instructions on page 5 of Operation Manual under VOLTAGE SELECT to change from 230V to 208V. If problem is not corrected, call an electrician. EE 6, EE10, EE16 Thermistors failure Call for service. Check that nothing is blocking air intake openings on oven back or that oven exterior is very hot. Correct. Wait a few minutes and try again. 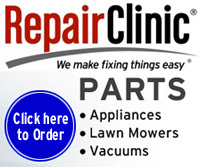 If problem persists, call for service. EE 8 Circuit failure Call for service. Check page 11 in the Operation Manual. Touch STOP/CLEAR pad, and reprogram correctly. EE 0 Fan lock error Call for service. Touch STOP/CLEAR pad. Wait a few minutes and try again. If problem persists, call for service. * EE 1 and EE 2: Can continue to use oven before service; however, check food carefully as additional cooking time will be needed. Any time the EE is flashing, the servicer should be called. When EE is not flashing, check the reason and correct. Service is not necessary. F1 - Thermistor open - No heat or thermistor sensing error. F2 - Thermistor short for cooking - No heat in 10 seconds after cooking starts. F3 - Thermistor short after cooking - Thermistor temp does not go down after cooking ends. F4 - sensor open - Humidity sensor sensing error. F5 - Damper switch sensing error.